The council, supported by volunteers from The Butterfly Garden and Cheltenham residents, have been spraying, painting and placing zingy lime green bikes around the town to signify the Bloor Homes Cheltenham Festival of Cycling featuring Tour of Britain’s stage seven visit on Saturday 9 September. Festival organisers have been delighted with the response from residents who have donated and painted bikes in lime green. Everyone is now being invited to explore the zingy lime green bike trail and snap a selfie with one of the lime green or arty bikes tagging your photo with #bikespotter , offering the chance to win hospitality tickets at the Bloor Homes Cheltenham Festival of Cycling . Entries close on 7 September. 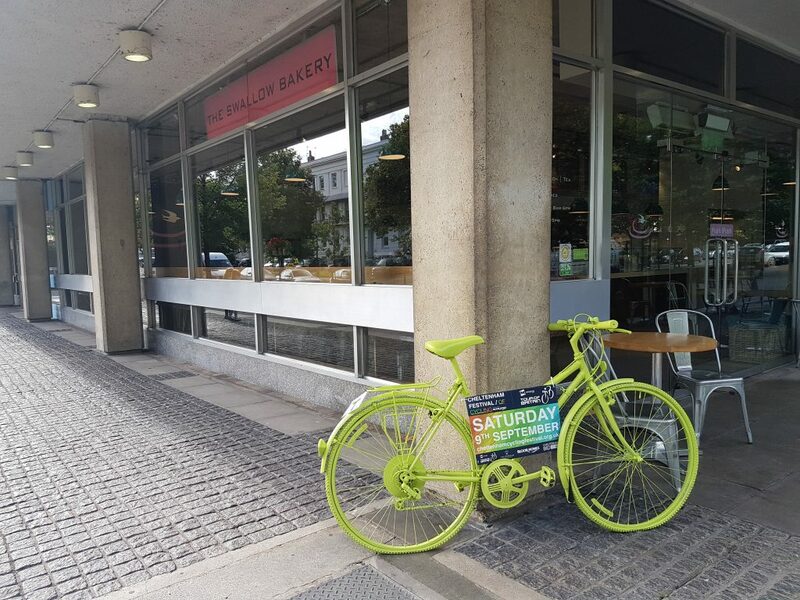 Tracey Crews, project sponsor of Bloor Homes Cheltenham Festival of Cycling continued “It’s fantastic that we can see so many vibrant lime green bikes dotted around the town waiting to be snapped by residents and visitors. In addition, this bank holiday weekend will see the launch of a free fun treasure trail for families to complete. There will be 11 bikes which will be marked with orange pins on the festival website map . Each of these 11 bikes will have a letter tagged to them (multiple letters in some locations) so that families can enjoy a treasure hunt to find all the letters. Ending at the Wilson, participants are asked to hand in their form and pick up a small prize.